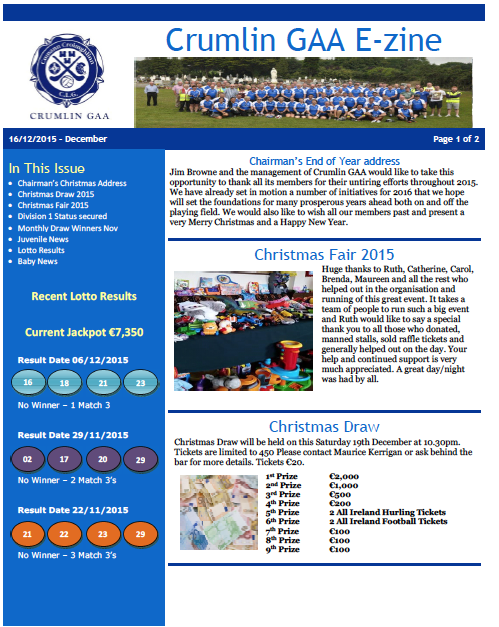 The first ever edition of the Crumlin GAA Ezine has been launched, click here to download a copy. With this we hope to bring you monthly updates on all things Crumlin related. Each edition will hopefully be no longer than 3 pages unless we win a championship and a full pull out section is required. The ezine will published roughly every 4 weeks by email, but there will be hard copies available in the Club for parents, players, social members etc to bring home with them. If you know of anyone who would be interested in subscribing to the Ezine just reply to this email with their email address and I will add them to the distribution list. Furthermore should you wish to unsubscribe to the Ezine just email crumlinhfcc@gmail.com. Finally if you have any information, photos, ideas or suggestions about anything in or not in the Ezine please contact me as I’d be happy to hear from you and include your piece in the next edition.